VOLGA GAZ A3-24 in 1/43 SCALE from USSR CCCP RUSSIA - GREAT SHAPE ! Model Car Group 1967-1992 Volga GAZ M24 Black Color in 1/18 Scale. New Release! Model Car Group 1967-1992 Volga GAZ M24 Volkspolizei in 1/18 Scale. New Release! IXO ATYALA 1:43 diecast VOLGA GAZ 24-10 RUSSIAN in WHITE NEW in pkg. Gaz 21 Volga M21 USSR 1957 Legendary soviet car 1/24 Yat Ming Rare!!! 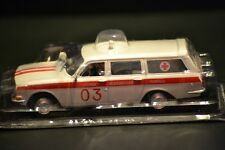 Model Car Group 1967-1992 Volga GAZ M24 Taxi White in 1/18 Scale. New Release!